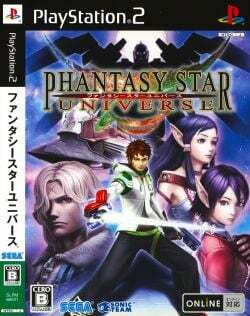 Game description: Phantasy Star Universe offers two complete RPG experiences - a single-player action adventure spanning multiple planets, and a robust online multi-player component. The game offers long-time fans the epic experience they have been clamoring for. The solo adventure features more than 40 hours of gameplay, an emotionally engaging story, traditional cut scenes, and strong character development. The title's hero is Ethan Waber, a 17-year old cadet intent on saving his sister, who is living on a planet under siege by mysterious life forces called THE SEED. In Online Mode, players are given the opportunity to create their own characters from a range of races, and they get to explore all three planets in the Grarl solar system. Fans can travel with a squad of other adventurers, enter urban sprawls teeming with hundreds of other players, and build their avatars into powerful warriors. Phantasy Star Universe, often abbreviated as PSU, is an action role-playing game similar to the Phantasy Star Online games. It takes place in the same universe as the games of the Online series and the original series before it, but in a different star system called Gurhal. Like most of the PSO titles, PSU is playable in both a persistent, massively multiplayer online network mode (Unfortunately, not working on PCSX2) and a full featured single-player story mode. Description: Enemies stop moving. This is particularly an issue in Chapter 7, where you have to fight a boss that's initially invisible. Because of this bug he will stay invisible and you'll be unable to progress. Make sure you have/create a regular Memory Card Save before this point, or you will have to start over the game, because Save States save this bug. This page was last edited on 14 April 2018, at 01:58.